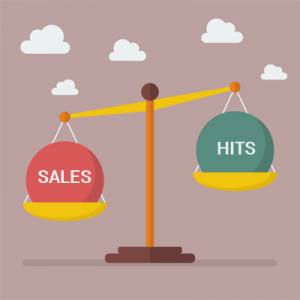 Does Increased Hits from SEO Equate to Sales? You probably wouldn’t be reading this blog if you weren’t at least somewhat interested in having one of the coveted positions on Google’s first page for one or more high-traffic keywords. So here’s a quick question: why is that important to you? What we’re getting at, is that a lot of small business owners seem to lose track of this point somewhere during the search engine optimization process. In fact, your website designer can even be partly to blame – they’re obsessed with the aesthetics of a website and want to look as visually appealing as possible. While an internet marketing professional is preoccupied with calls to action, bounce rate, on-page times and conversions. What’s easy to forget is that your website doesn’t really need “hits” as much as it needs buyers. Quality over quantity is just and important in digital marketing as anything else. Now, it’s important to be clear that there are a lot of different ways to measure buyers. For some, it actually means clicking a button to place something into a shopping cart and checking out. For others, though, it could mean downloading a white paper, registering for an online newsletter, or providing contact information so that a sales rep can follow up later. Remember, you can lead a horse to water but you can’t make him drink! So onsite optimization is equally, if not more important, than the number of hits your website is receiving. Know your customers and what they need or want. As soon as they land on your website, make it easy for them to access the information they seek using strong calls to action. So it makes sense to pay less attention to the actual hits from SEO and more attention to what your customers are really looking for, or the marketing messages you’re putting on your website and landing pages. After all, all the visitors in the world stemming from search engines aren’t worth a click if they don’t turn out to be interested in what you’re selling. In fact, it could even do more bad than good by wasting the time of your sales team, or worst yet, increasing your websites bounce rate. To sum up, SEO is incredibly important in today’s digital marketing landscape and the most of the time more traffic is going to lead to an increase in conversions. Just don’t get so focused on the numbers that you lose sight of your short and long-term business goals. Contact us today for a free website evaluation!